Limited. The varieties sold as bedding plants can tolerate light frosts, but are meant to be grown as summer annuals. Mix a light application of a balanced organic fertilizer into the soil prior to planting. In summer, drench plants every two weeks with a liquid fertilizer. Ageratum and Petunia. African daisies look best when planted in groups or masses, perhaps framed with dusty miller, ageratum or annual verbena. Osteospermum make great flowers for containers. Only a few varieties of osteospermum are grown from seed. The heavy flowering varieties are propagated from rooted stem cuttings and sold as potted plants in spring. Set plants out at about the time of your last spring frost. 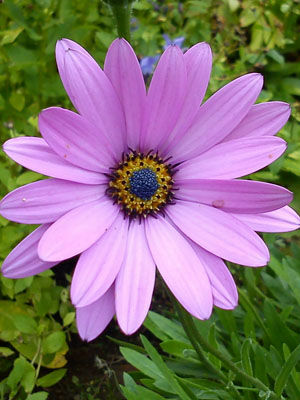 Osteospermum colors include pink, white, and shades of yellow. The plants will bloom for eight weeks or more if old flowers are removed. When cut as soon as they open, osteospermum make good cut flowers. As plants age, they sometimes develop problems with powdery mildew. Aphids may occasionally feed on new growing tips and buds. Pinch off large colonies.